On 03rd May 1983 while working 6L32 Teesport - Hunslet East Oil Terminal block oil train. 47367 ploughed into the back of an e.c.s. parcels train for Redbank on the up goods lines at Neville Hill. The loco off the e.c.s. parcels train had been off to get some more vans from the sidings and as a net result required the parcels train to set back in the loop when 47367 had entered the loop. The result being the back vehicle riding over the buffers and destroying the number 1 end cab of 47367 and the driver only survived due to the seat coming adrift which saved his life. Help came form Healey Mills breakdown train around 13:30 and 47367 was initially moved to Neville Hill TMD before being moved to Crewe works. Recorded as being out of service from 09/05/83 and received new number 1 Cab fitted at Crewe works and released on 09/11/83. I entered the loop with a heavy train and probably wasn't travelling along as slowly as I maybe should have done, but at the same time, something strange was happening with the train in front. It appeared to be moving towards me as I approached it. I was questioned by my boss a few days afterwards and one of the questions asked was "was the train you hit coming towards you?" to which I said I wasn't sure. All I was interested in was slamming my brakes on as hard as possible. After that I never heard another word about the incident for a good ten years. There was no inquiry and no blame was laid at my door. One day I was talking to a Traction Inspector called Jimmy Hatch and the incident was mentioned. I told him I thought it was strange that nobody had ever come back to me about the incident. He was shocked that I'd heard nothing about it in the meantime. He told me that the signalman had taken the blame for it because apart from the fact that he shouldn't have been turning my train in on top of another train like that, he was also allowing a shunting movement to take place. The parcel train had stopped at the light at the end of the loop, detatched the loco, gone into the sidings and picked up a few more vans, gone back onto his train in the loop, and then propelled his train back behind the light. Thats when I was approaching it. I only actually hit the back of the van doing a very slow speed, but because of the weight on my loco, the van sprung up over the buffers of my engine and pranged the front where the head code indicator is. Read into both reports what you will. The only thing I will add to it is that if the railways had deemed me to be guilty as the first report said, I'm bloody sure that I'd have had my knuckles well and truly rapped, even considering that I was supposedly "inexperienced" (I'd been passed as a driver for 18 months at this time), but I can honestly say that I've never heard anything official about the incident since. 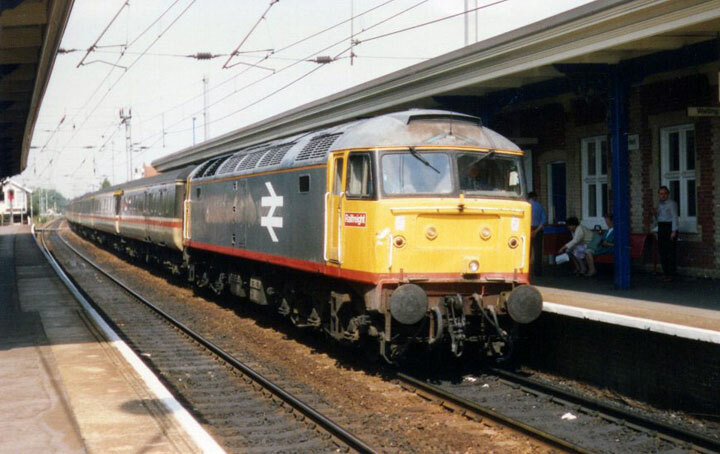 Last worked 19/08/01 4E78 20:18 Southampton - Wilton as far as Basford Hall, stopped with wheel set problems, sent to Crewe EMD for tyre turning then taken to Fragonset at Derby for bogie change 23/08/01, work was never carried out & loco withdrawn. On September 2002 Freightliner put up there 1st tender list with 47367 and 47376 where the only two 47's from the tender to pass into presavation on 21/11/02.